A band in seemingly constant flux, Moira were formed in June 1975 as a melting pot of jazz and rock musicians from southern Germany, with the earliest known line-up being: Embryo's Edgar Hofmann (winds), with Jürgen Kanwischer (guitar), Fred Braceful (drums) and Helmut Weber (piano). After Braceful left (disappearing from the scene) he was replaced by Guillermo Marchena for a while. Increasingly Moira became the vehicle of Jürgen Kanwischer, with Edgar Hofmann (also working in Embryo), and others. The first known recording, live in 1977, consisted of Kanwischer and Hofmann, with Rainer Frank (bass), Geoffrey Ramos (congas), and Ernst Bier (drums). Adding keyboard player Burkhard Plenge, and former Missus Beastly drummer Butze Fischer, the debut LP indeed showed a wide range of influences. CRAZY COUNTDOWN amounted to a distillation of Schneeball jazzy styles, containing seven quite different tracks, all full of vibrant jazz-rock energy. Moira were basically a side-step from Embryo, sans the Burchard touch or vocals, sometimes closer to earlier Munju, fronted by some lively guitar and lots of invention. Edgar Hofmann was credited as a guest on the LP for some reason, but was still with the band for a short while after, before returning to Embryo. Then, Butze Fischer went on to Guru Guru, replaced by Eberhard Bronner, and Moira underwent a Soft Machine like "all change" which meant that by the time of the second LP there were no musicians in common with the first. 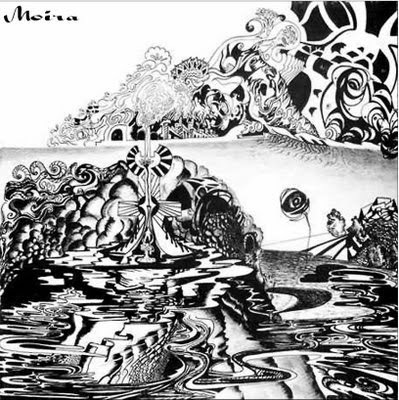 MOIRA, aka "Reise Nach Ixtlan" (recorded at Golöden Line Tonstudio in 1984) is indeed very obscure, and only recently came to light via a review from Tom Hayes of Gnosis. Still in the Schneeball fusion vein, although the style of the musicianship clearly displays a youth brought up through the new-wave era, with a rhythm section comparable in sound to Peter Frohmader's Nekropolis band. The guitar work on the opening track sounds very Terje Rypdal though, and there's a deliberately retro feel to the organ and nods to Mahavishnu Orchestra in "Oase". There are a lot of styles at play, and too many influences to name them all, though notably they seem to have been listening to Munju's BROT+SPIELE before composing the quite eccentric "Einsame Schatten". A fine album that is all too short really. This later incarnation is also historically important, as one of the early bands to feature Michael Stoll (previously with Didier) who also played in Grachmusikoff and Schwoißfuaß, and has since become a key member of the reformed Faust. Also, Eberhard Bronner featured on one Schwoißfuaß album, and keyboard player Martin Ziegler went on to form Rejoice.